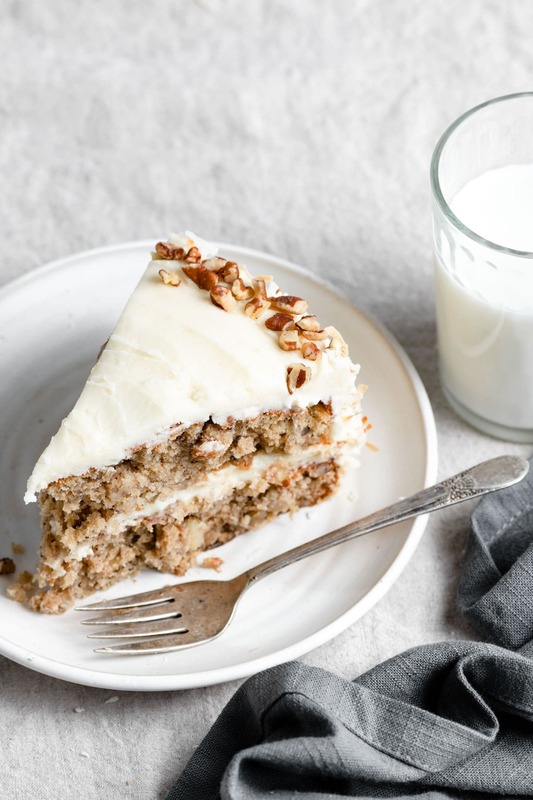 The best Hummingbird Cake! 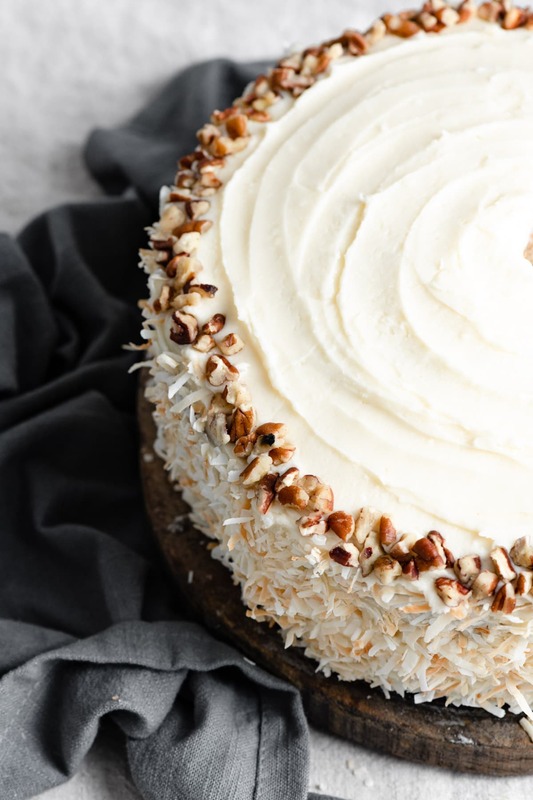 It’s a tender, flavorful cake brimming with fresh pineapple, bananas, pecans, and spices and finished with luscious cream cheese frosting and coconut! The perfect cake for Easter or any other special occasion. 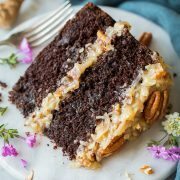 I think of this cake as banana cake meets the tropics, in that it is loaded with bananas, laced with fresh pineapple and covered in sweet, toasted coconut. It will remind you a lot of banana bread, but with a bonus of decadent cream cheese frosting of course. There are so many delicious flavors and perfect textures in this cake. The cake has a nice tender thanks to the sugar and bananas and it has a nice moist crumb thanks to the vegetable oil, it’s dotted with juicy bits of pineapple and crunchy toasted pecans, and it’s finished with a creamy, lightly tangy frosting and finished with crisp bits of toasted coconut (or chewy coconut if you like it un-toasted). It’s an old fashioned style cake that will likely remind you of home. Made from scratch and sure to please! What Ingredients go into Hummingbird Cake? Fresh pineapple – I love this cake with fresh Dole pineapple (and you can just eat the leftover) but canned, drained pineapple will work too if you don’t have access to good fresh. Overripe bananas – don’t use yellow peel bananas but don’t use black rotten bananas either, generously speckled bananas will taste best. All-purpose flour – I use the scoop and level method when measuring out the flour, for most consistent results use a kitchen scale to measure ingredients like flour. Eggs – these binds the ingredients in the cake and helps the cake rise. Cinnamon and nutmeg – these spices make this cake sing! Salt – don’t forget the salt! Have you ever accidentally left this out? The cake will taste flat. Granulated sugar, brown sugar and powdered sugar – that’s a lot of sugars, but we’re making cake! Vegetable oil – canola oil will work just the same. Oil offers a moister cake than butter would. Vanilla extract – added to both the cake and frosting for that irresistible background flavor. Butter – use unsalted so the frosting isn’t overly salty. 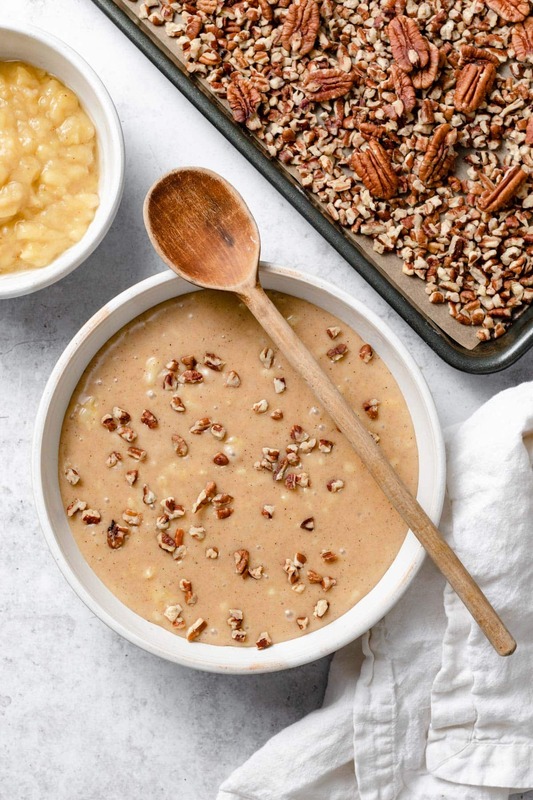 Pecans – these are toasted to add even more flavor. Walnuts would work great too. Cream cheese – stick with Philadelphia brand for consistent results. Shredded coconut – use medium (standard) shredded coconut. Sweetened or unsweetened will work. Preheat oven to 350, grease and line and flour cake pans. Whisk together pineapple with 1/4 cup flour. Whisk remaining flour, baking soda, spices and salt. Whip white and brown sugar with eggs until pale and fluffy, mix in oil and vanilla. Fold in half of the flour mixture, then mashed banana, then remaining flour mixture. Finish by folding in pineapple and pecans. Pour into cake pans, bake until set, about 35 minutes. Let cool in pans about 10 minutes, then invert and cool on wire rack. Prepare frosting and spread over cooled cake. 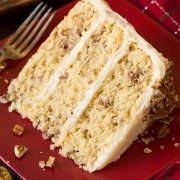 Spread coconut along outside of cake, decorate top with pecans. Use fresh pineapple for best flavor. It has a lot more flavor than the canned. Use a scale if possible to measure ingredients for consistent results. Line the cake pans. I don’t recommend just spraying, we’ve all had at least one experience with a cake or dessert sticking but parchment paper helps prevent that. Don’t over-mix the batter. This is a somewhat dense cake with all the fruits, so if you were to over-fold the batter it may end up too heavy. Just mix until the streaks are gone. Careful not to over-bake. If you bake longer than needed the cake will start to get dry. Bake just until set in the center. The toothpick test works great. Start with ingredients that are nearly room temperature. I’ll often even cheat and use the microwave but the point is that the butter should still be cool and especially the cream cheese. Chill the frosting. Once the cream cheese frosting is all mixed together pop the mixing bowl in the freezer for a 3 – 5 minutes, return to stand and mix again. Repeat a few times as needed until you’ve reached the consistency you want it. Can I Bake it in a Bundt Pan? Yes. It will probably take about 60 – 65 minutes at 350 for a Hummingbird bundt cake. Then you’ll only need about 2/3 the amount of frosting. Can I Make the batter into Cupcakes? Yes. Divide batter among paper lined muffin cups filling each 3/4 full, bake at 350 about 18 – 22 minutes. 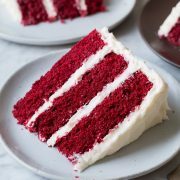 How Should I Store Hummingbird Cake? After you’ve frosted the layers keep store the cake in the fridge so the frosting won’t melt away. Let rest at room temperature about 30 minutes before serving. 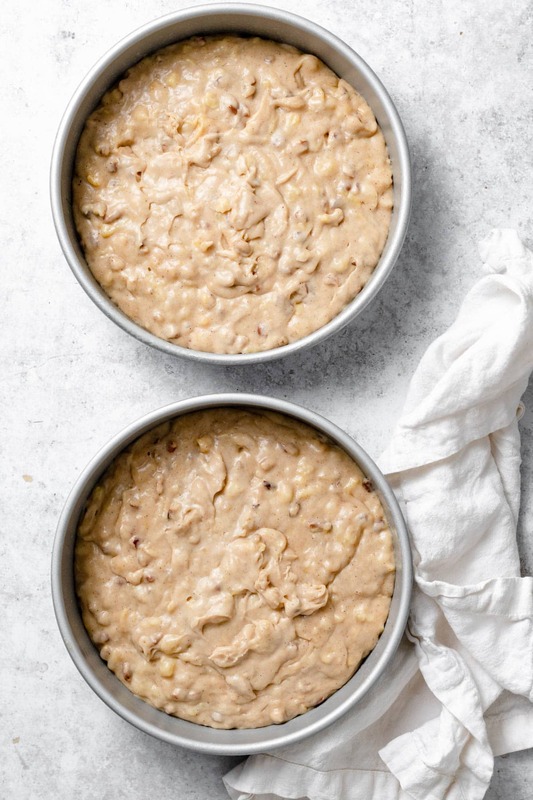 Can I Freeze Hummingbird Cake? The unfrosted cake layers should freeze well for up to 2 months, wrap in foil and store in an airtight container. The cream cheese based frosting won’t freeze well so just add frosting after thawing at room temperature. I haven’t tested in this recipe but in most baking recipes I’m able to get away with substitute half of the oil with unsweetened applesauce successfully. 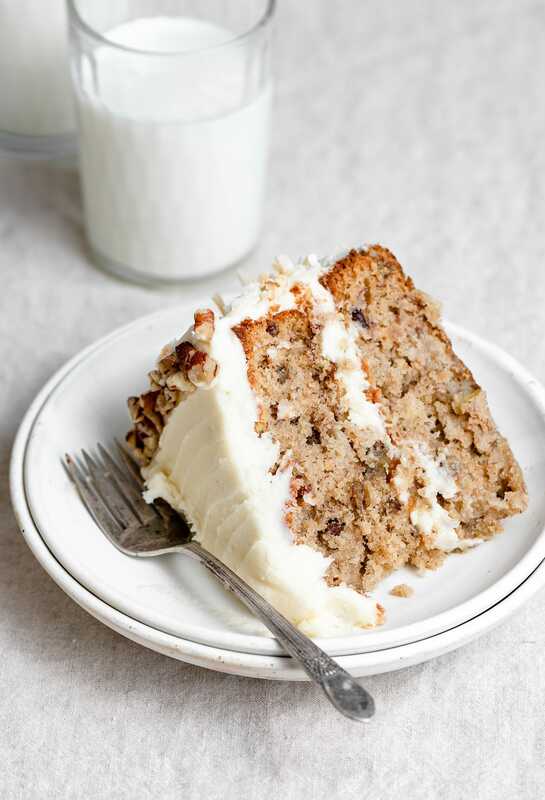 How Can I Ripen Bananas Faster for Hummingbird Cake? To ripen bananas faster store them in a paper bag in a warm place. Some say adding an apple to the bag will speed the process along even faster. I don’t recommend baking the unripe bananas to speed ripening as some suggest. Recipe originally shared April 2014, photos have been updated. The best hummingbird cake! 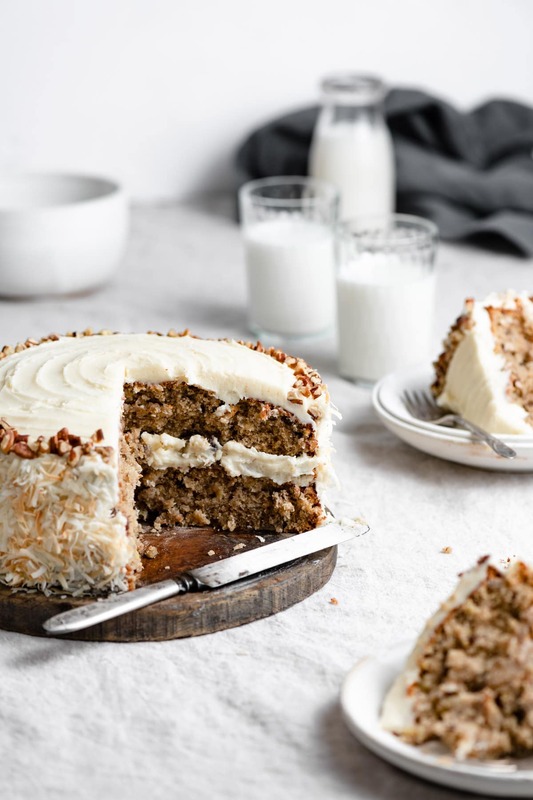 It's a deliciously tender and moist cake filled with pineapple, bananas, pecans and spices and it's finished with a rich cream cheese frosting and plenty of coconut. Preheat oven to 350 degrees. Butter two 9-inch round cake pans (at least 2-inch tall) and line bottoms with a round of parchment paper. Butter parchment paper and lightly dust pans with flour, shake out excess. In a small mixing bowl, stir together finely chopped pineapple with 1/4 cup all-purpose flour, set aside. In a medium mixing bowl whisk together remaining 2 1/4 cups flour, the baking soda, cinnamon, nutmeg and salt. In a separate large mixing bowl, using an electric hand mixer set on medium-high speed, whip together granulated sugar, brown sugar and eggs until pale and fluffy, about 3 - 4 minutes. Slowly blend in vegetable oil, then mix in vanilla extract. Add half of the flour mixture and using a rubber spatula, fold just until combined. Add mashed bananas and fold to combine, then add remaining flour mixture and fold until combined. Fold in pineapple mixture and chopped pecans. Divide batter evenly among prepared cake pans. Bake in preheated oven until toothpick inserted into center of cake comes out clean, about 34 - 40 minutes. Remove from oven and allow to cool in cake pans 10 minutes, then run a knife around edge to loosen and invert onto wire racks to cool completely. Frost with cream cheese frosting and gently press coconut onto sides. If desired decorate top with a ring of whole or chopped pecans near outside edge. For the cream cheese frosting: In the mixing bowl using an electric hand mixer fitted with the paddle attachment, whip together cream cheese and butter until smooth and fluffy. Add powdered sugar and vanilla and blend again until shade becomes whiter and frosting is fluffy. To firm up the frosting a bit freeze in 3 minute increments mixing between increments until it's reached a slightly stiffer consistency. *Pineapple should be chopped into tiny bits about 1/6-inch. Hala: Hello. Just tried this cake yesterday and it was awesome.. I have never tried any hummigbird cakes before so truly I didn’t know what to expect.. looking at the amount of flour I knew it would be a bit dense.. and it was. Now, looking at the comments I knew it should be that way :) everybody loved it at the gathering yesterday. I’m so glad I found your blog. You are such an inspiration to me. I made this cake today and it tasted so good, but the cake itself cracked at the top after I put the frosting. Also, my presentation of the cake wasn’t quiet fancy as yours.